Glacier walk is a great glacier adventure where you can try for yourself how it feels to walk on glacier ice. We walk on Sólheimajökull glacier (a part of the Mýrdalsjökull ice cap) on the south coast of Iceland where we have our glacier walk base. Nearby Skógar and Vík. It is only about 15 – 20 minute walk from our base to the glacier. We walk through the varied landscape on our way, formed by the glacier for the past thousands of years. There you will see how fast the glacier has been melting for the past 15 years. 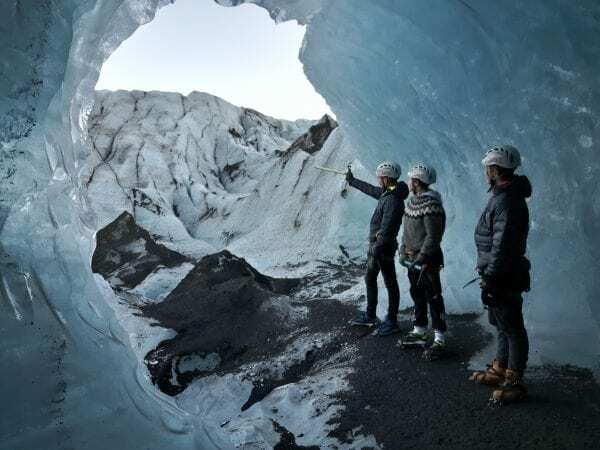 After safety briefing and a lesson in ice walking we will head onto the glacier to experience this unique environment with some amazing terrain with crevasse, sink holes and ice ridges. Sólheimajökull is the southernmost glacier in Iceland, the ice is up to about 200 meters thick and the total size with the ice cap Mýrdalsjökull about 600 km2. Underneath the main ice cap is the caldera of the volcano Katla, one of Iceland biggest volcano. Please note that this tour is MoP (Meet on Point). Instructions on how to reach the starting point you can be found through this link.